Whether you are diabetic or not, knowing your sugars, sweeteners, and substitutes will help you decide what products to buy, what ingredients to use, and what to avoid in order to have better control over your blood sugar levels and of course, your overall health. I’ve put together a quick reference chart below showing you each category of sweetener with examples in that category, where it’s found and used, it’s Calorie Content, it’s Glycemic Index (how fast it effects blood sugar levels) and any harmful side effects. For a clearer (and enlarged) version of this chart, click it to open it in a new tab/window and zoom. The information for this chart has largely been sourced from the Sugar and Sweetener Guide website. It is unclear whether this is a sponsored site, but similar data is available on Wikipedia and other nutrition websites. Armed with this knowledge of what’s what is the world of sweeteners, we should be in a better place to evaluate our options while cooking or eating out! In the next part of this series I’ll share with you what I think is a helpful strategy for dealing with sweeteners in different types of situations: right from in your daily meals and grocery shopping to random sweet cravings, special occasions, and buffet parties. Ah exactly what I needed! I’m sure I’ve left out others too! 😀 But thanks for this addition Sophie. 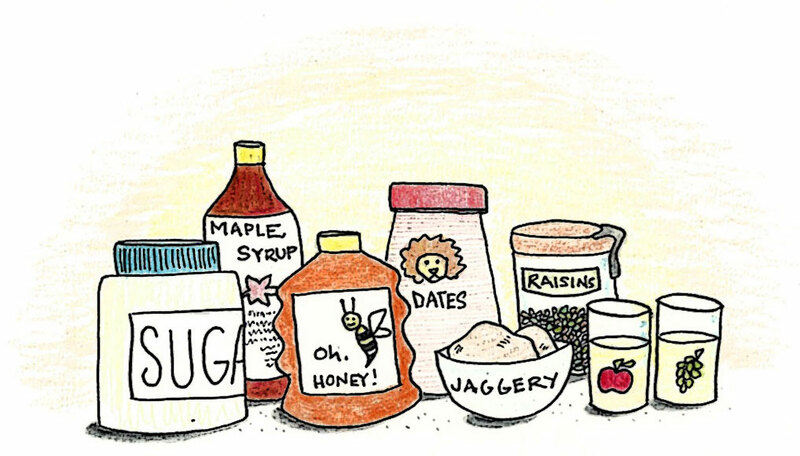 Low GI natural sweeteners are hard to come by! Thanks a lot Violet! I hope this reaches a lot more people through sharing! Excellent ! Thanks for sharing. Reblogging it :).